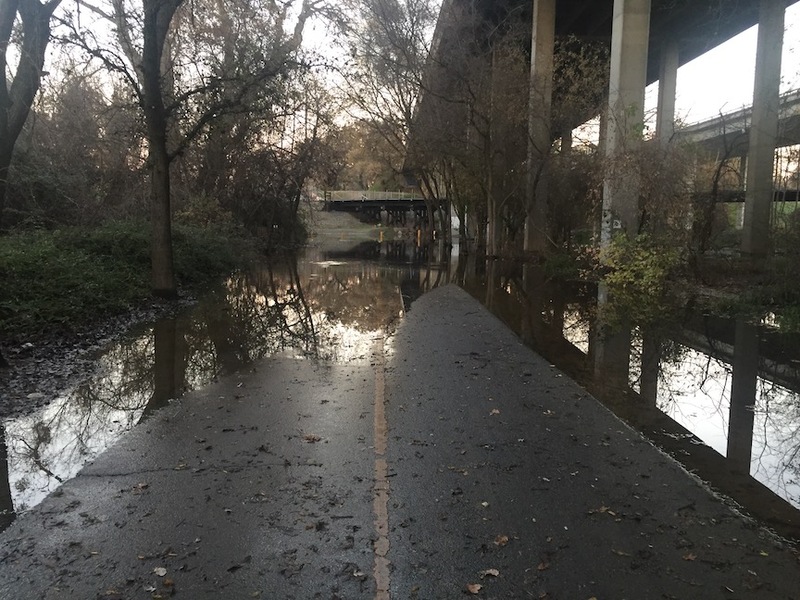 There are two low spots on the American River Parkway trail (officially called the Jedediah Smith Memorial Trail) that flood even under moderate rainfall or flood conditions. It may seem strange to bring these low spots up when just last week perhaps 90% of the trail was underwater. The trail is in a riparian area, and so will and should flood during major flood events. But the trail is also a major commuter route for hundreds people who work downtown and live to the east, as well as a few reverse commuters like myself. After the jump, details and solutions for these two problem spots. At the junction of the trail and the Sacramento Northern trail, under the Hwy 160 and railroad bridges and adjacent to Del Paso Blvd (the part most people don’t know about), there is a low area that floods easily, and stays flooded for long periods for time even as the river declines and other places dry out. It is part of the natural channel that the river uses to spread flows at higher volumes, but the outlet has been cut off so it doesn’t drain afterwards. This particular spot has been flooded for well over a month now, and except for a brief period, all the way back into December. That means that the frequently used commuter route from the parkway over the old Sac Northern railroad bridge and into midtown has been closed, inaccessible. The solution here is to both raise the trail and provide better drainage so that water drains away after flood events rather than ponding. About 50 feet of the parkway trail and about 150 feet of the Sac Northern trail should be raised. I believe that the Sac Northern trail is actually under the jurisdiction of the city, while the parkway trail is under the jurisdiction of Sacramento Regional Parks. The second problem spot is under the powerlines that cross the trail near the Ethan Way access point next to CalExpo. A dip here fills with water in light rail and is slow to drain. There is a minor natural channel here that must be respected, not blocked. The solution is to raise the trail so that water can flow underneath, and the slow drainage through the area does not flood the trail. I intentionally used the phrase ‘low point’ in the post title, because I think that these kinds of issues, going on for years, are the kinds of issues that Sacramento Regional Parks is unable to solve. It is a low point in management of the parkway. I’ll have more to say about that in future posts. Thank you. If you are specifically concerned about the Sac Northern trail, you should know that the city has given Union Pacific the go-ahead to close C St where it crosses the railroad tracks between 19th and 20th, without also negotiating a path extension south to D St. The result will be that Sac Northern will only be accessible from 19th St, no longer from 20th St or anywhere to the east. For me, it still works because I use 19th, but for everyone else that uses 20th and C St, this makes the trail much less accessible. The closure is not necessarily a bad idea, but the closure without a corresponding solution for bicyclists and walkers is definitely a bad idea. I meant to write about this when it happened, but was too busy.